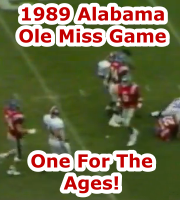 1989 Ole Miss / Bama – It Was a Game For The Ages. October, 1989...Alabama was out for revenge. The year before, Ole Miss had ruined the Crimson Tide’s homecoming game with a shocking upset victory. Adding insult to injury, Alabama’s quarterbacks did not complete a single pass, the first time that had happened since the Tide’s opening game of 1971. Alabama entered this October game undefeated, but still unsure of their team. Gary Hollingsworth, who had begun the season as the backup quarterback, became the starter when Jeff Dunn was injured againstKentucky. Hollingsworth was a star quarterback at Hamilton High School, but his achievements for the Crimson Tide were primarily as a pitcher for the baseball team. No one was sure what to expect from the Tide offense. The 1st quarter was shocking. Ole Miss jumped all over Alabama, building a quick 21 to 0 lead. For the second year in a row, Alabama’s season was about to be sabotaged at the hands of the Rebels. For those of us in Jackson that day, during those 1st quarter moments the Ole Miss fans were insufferable. Then...history, and legends, were made. Alabama’s offense exploded. Ole Miss helped with a couple of turnovers, and Alabama scored... and scored... and scored. The Crimson Tide put up the fastest 48 points anyone could remember and led 48 to 21 by halftime. The final score was a 62 to 27 bloodbath. Gary Hollingsworth suddenly became a national name, and was ultimately named the SEC offensive player of the year. Alabama became a player in the national championship race, rose to number 2 in the polls, and won the SEC championship (co-champions). It was one of the most memorable games in the great history of the Alabama-Ole Miss rivalry, which began in 1894, and defined a championship season for Alabama.